This page contains affiliate links. If you purchase anything through these links, I will earn a small commission at no additional cost to you. Oftentimes, I end up connecting musicians with the tools they need to move their careers forward. Sometimes this just means making a well-placed recommendation. At other times, it means a little more hands-on work, and the building of a service provider-client relationship. In this post, you will find my top recommendations for tools and resources in a variety of categories. And, just to let you know, I can help you with many if not all of the following areas of your career, and I’m happy to do so. Feel free to drop me a line if you have any questions. 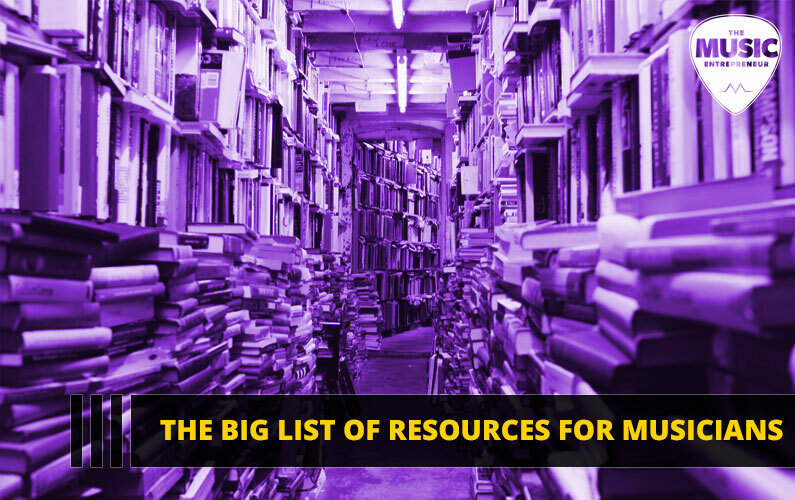 So, without further ado, here’s my big list of resources for musicians. Note: I’ll be updating this list from time to time with new resources. I’ve recommended CD Baby to many musicians, and none have come back to me with any complaints. They are not the cheapest option for distribution, but they offer certain advantages others do not, such as your own artist store on their website. I’ve been using CD Baby since 2007. If you’re planning to release a lot of digital content in any given year, then DistroKid is worth a look. Instead of charging you per release, they will only charge you a one-time annual fee to upload as much music as you want during that 12-month period. The one downside is that you will pay extra, per-release, for various royalty collection options. I’ve been experimenting with DistroKid since 2017. Since I’m an affiliate, I would be negligent not to mention Ditto Music. The main advantage they offer is that they will distribute your release further than the companies just mentioned. I have a good working relationship with them, but have never taken advantage of their distribution service, and may give it a try in the future. Setting up your own record label has certain advantages, even if you don’t end up managing other artists. It can boost your credibility, help you collect more money that’s owed you, and assist in uncovering more opportunities for your music. If you’re thinking about setting up a record label, I would suggest bypassing a lot of the headache and paperwork. Have a look at a post titled: How to Start & Run a Record Label. In that post, you will learn about a product called Record Label in a Box. I strongly recommend picking it up if you’re serious about starting your record label. I’ve personally talked to the people at Ditto Music, and the support they offer alone is worth the asking price. Few things are more important than self-education. I don’t care if you’re reading blog posts, listening to podcast episodes, watching videos on YouTube, buying courses, joining online communities, subscribing to magazines, or otherwise. Something is better than nothing. I would argue that The Music Entrepreneur HQ (you’re here) is fast developing into a valuable resource for musicians and music entrepreneurs looking to take their destinies into their own hands. Sure, there are plenty of great blogs out there, and I’ve even covered a few. But if you’re looking to be introduced to new opportunities and great resources, I would argue you’re already in the right place. To me, email marketing is far more important than most other digital marketing channels. Yes, it’s more important than social media, hands down. My tool of choice is MailChimp. It’s free to start. Their user interface used to be a bit of a challenge to learn, but it’s gotten a lot better as of late. If you haven’t started building your email list yet, please click on the provided link and sign up for an account immediately. And, if you feel you need any help with your email marketing strategy, you can get in touch with me. I look forward to hearing from you. I know a lot of people that don’t enjoy writing. I’m not one of those people. I’ve written thousands of blog posts and articles on dozens of topics, including: music, creativity, blogging, podcasting, freelance writing, personal finances, marketing, leadership, personal development, architecture, freight, tires, big data, e-learning, and a great deal more. Heck, I even wrote a book and have a second one on the way! I’m not sure if you’ve noticed this yet, but there’s quite a bit of writing involved in building a music career: emails, bios, blog posts, grant applications, social media updates, and so forth. So, if you need help with putting together your written document, and you still want to be able to put your name on it, you can learn more about our ghostwriting services here. Branding is important as a musician. If you get it right, people will begin to associate your font, colors, logo, and other aspects of your image with you and your style of music. If you do it wrong, you could end up becoming the laughing stock of music blogs and magazines. When it comes to graphic design, there are so many approaches, methodologies, and styles that it’s impossible to recommend just one individual or company. So, I’m going to recommend 99designs, because all you need to do is put together a brief, start a contest to have many designers vying for your project, and pretty soon you’ll have numerous designs in various styles to choose from. But if you’d like to work with me, I’m open to the idea. Yes, I design graphics too, so feel free to get in touch. I don’t know too many musicians that don’t require marketing. The tricky part is in understanding what you offer and how it should be promoted. Even the best marketing campaigns can fail to produce results at times, so if you aren’t strategic in how you go about promoting your music, it’s going to be an uphill battle. To gain a better understanding of the various methods you can use to market your music, and how to go about growing your fan base, I recommend picking up a copy of my book, The New Music Industry: Adapting, Growing, and Thriving in The Information Age. But if the DIY route doesn’t exactly appeal to you, then you can get in touch with me and we can discuss your marketing needs. In episode two of the podcast, I interviewed James Moore of Independent Music Promotions. I would suggest having a listen to this episode, as it will give you a sense of who James is and what he does. If you’re looking for PR services as a musician, there’s no one else I would recommend. I’ve gotten to know James over the course of several years, and I know he knows his stuff. He will work hard on your behalf if he believes in your music. Let him help you get the publicity your music deserves. If you want to book gigs, get your music reviewed, or get radio airplay, you’re probably going to need a press kit. In some cases, you may need both physical and electronic versions. Before you do anything else, I would suggest looking at this infographic, especially if you’re planning to develop your own press kit: Elements of a Press Kit. If you need help putting together your press kit, then feel free to get in touch. I can point you in the right direction. As hard as it may be to believe, radio still matters. Yes, streaming and smart device use is growing fast, but for the immediate future, there will still be value in being heard on the radio, even as an independent musician. There are a few services out there that will initiate independent radio campaigns on your behalf. The problem is that it can be hard to find a reliable one. So, if you’re thinking about organizing a radio campaign, and you need some help, feel free to get in touch with me. It’s undeniable – social media is an important marketing channel for musicians. I don’t see it as being a game-changer, or the silver bullet in a musician’s career, but it’s a necessary evil. And, who likes to spend all their time managing their social streams anyway? Wouldn’t you rather dedicate your time to your art? That’s why I offer social media marketing services. If you think you need help, and have the budget for it, feel free to get in touch. I interviewed Ross Barber of Electric Kiwi in episode three of the podcast. He provides custom web design services for musicians. I’ve seen his work, and it’s good. I highly recommend going through him for your web design needs. Alternatively, I can also help you with your website. Guess who built this one? I did! So, feel free to get in touch if you’d like me to help you start building your online presence. If you’re going to build a website, you’re going to need web hosting. By the way, you can generally purchase domain names through your chosen web hosting provider as well. A good all-in-one solution is Bandzoogle. I’ve talked to Dave Cool, and I am convinced – it’s one of the best web hosting/website solutions for musicians, hands down. I like to use self-hosted WordPress installations for all of my websites. So, that generally means purchasing hosting through a web hosting provider. By the way, these days, I use Elegant Themes almost exclusively when building a website with WordPress. My current recommendation for hosting is Cloudways, though I’m always trying different services, and that could change in the future. The right tools and resources can make your life a lot easier. I hope the above items help you build the career of your dreams. Did I miss anything? Is there anything else I should add to this list?